Weighty Matters: Why taxpayers should care about bariatric surgery. 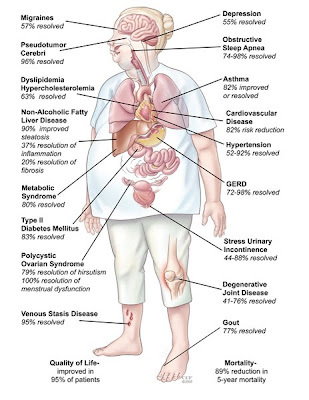 Why taxpayers should care about bariatric surgery. Bariatric surgery is a tough sell to the often ill informed general public. Invariably when stories are run about the cost of paying for gastric bypasses, the comments tend towards the suggestion that tax dollars shouldn't be spent on this type of surgery and instead the folks who need it should simply eat less and exercise more. In other words, the public thinks that because ultimately obesity can be described as the result of a mismatch between energy intake and expenditure, that medical care, life prolonging, quality of life improving, co-morbid disease curing medical care, shouldn't be offered through our provincial health care plans. Suggesting that we not operate on the obese because in theory all they'd need to do is eat less and move more is simply an exercise in biased weightism and ignorance. But frankly, even were it to be true, that argument shouldn't apply here in Canada. Thankfully our medical system is one that doesn't care about cause. We still treat smokers who develop emphysema and lung cancer, and we readily patch up drunk drivers who most certainly know better. I'd argue though, that those same angry folks, who I'm sure are multi-millionaires because they know the secret of the stock market - buy low and sell high, when faced with the dollar and cents realities of bariatric surgery, might decide to change their tune. The thing is, regardless of the cause of the problem, folks who qualify for bariatric surgery are quite often very sick folks. Sick to the point that they cost our health care system a great deal of money - money that's spent on increased physician and hospital visits and medications. They also cost our economy in terms of lost productivity, days off work, and in some cases, frank disability. They cost our country so much in fact that one Canadian study determined that the $16,000-$18,000 cost of the surgery is recouped in a scant 3.5 years following surgery, and given the incredible long term results of the surgery, both in terms of increasing longevity and decreasing morbidity, the surgery should not only be thought of as one that has a rapid cost recovery, it should be thought of as one that if readily available, could save our country hundreds of millions of dollars in direct and indirect health care costs. So has our country made bariatric surgery readily available? No, and recently in Ontario, the Ministry of Health has made it more difficult to obtain. Prior to November 2009 Ontario physicians were able to directly access out of country surgical centres to operate on in need bariatric patients. From start to finish, from submission of an application to Ministry to the day of surgery, that process used to take 4-6 months. However in November 2009 the Ontario government reported it would no longer allow physicians to apply directly for out of country surgery, instead patients would need to be seen at one of five provincial bariatric assessment centres. Using Ottawa as an example, since November 2009 the wait to be seen by our assessment centre has gone from 4-6 months, to over a year with the wait for surgery likely bordering on two years. Why? Sheer numbers. Yesterday the CBC reported that currently there are 1200 people on just the Ottawa Civic's wait list and I've been told that 300 more are added to that list monthly. Given that our government's announcement for increased access to bariatric surgery in Ontario reported a 2012 aim of a 2,025/year surgical capacity for the entire province, it would seem that by means of Ottawa alone, every 7 months Ontario's bariatric surgery wait times will grow by an additional year. Add in the folks clamouring for access at the other 4 Ontario assessment centres, couple that with the fact that Ontario's not operating anywhere near their hoped for capacity, and toss into the mix the growing demand for these surgeries and I wouldn't be at all surprised if every 3-4 months wait times in Ontario increased by a further year. There's another large fly in the government's ointment. Given the nature of health care in Canada, where operating rooms and operating times are precious, Canadian surgeons, world class as they may be, simply don't have the opportunity to do the same number of cases as their American counterparts which may be why in a recent news report, a representative for the Ottawa surgical centre reported that their death rate was 1/70 and that they were aiming to get that down to the 1/200 death rate that has been reported as this surgery's average mortality rate. The only problem there is the fact that the 1/200 rate is an aggregated rate for all surgical centres and certainly in the past, Ontario physicians only accessed centres that had been designated surgical centres of excellence by the American Society for Metabolic and Bariatric Surgery. The centre I used to access reported to me that their mortality rate was 1/1250. Ontario's Ministry of Health has reported that the reason they shut down access to the States was to improve access to care in our own province, but rather than improve access to care, in less than a year their changes have quadrupled waiting times and increased surgical mortality rates by an order of magnitude and I believe they're also costing us a great deal more money. The Ministry of Health reports that the cost of the procedure is $10,000 less when performed here in Canada than when performed down South. That's an odd statement given that the CBC yesterday reported that the case cost per procedure here in Ontario is $17,200, a price tag that's virtually identical to the ones the province was paying those surgical centres of excellence in the States. Furthermore, what that Ontario price tag doesn't take into account are the costs incurred by patients remaining on a waiting list for years at a time - a cost estimated by one study to be in the neighbourhood of $900/month. Consequently I would estimate that having a patient wait for 2 years for this surgery would likely cause the total health care costs for the procedure to be at least double what they would have been were access to the American centres available. Estimates put 3% of the population as qualifying for bariatric surgery. Taking Ontario's 12,000,000 residents that would mean there are 360,000 potential surgical candidates. Of course not everyone is going to want to opt for surgery, but even if only 5% of those who qualify sought access, Ontario would have to find the capacity to perform 18,000 surgeries. Given that our newly increased capacity is only 2,025 and combine that with the continued increase in weight of our population, the cost and risk of very sick patients remaining on a waiting list, the increased surgical risks here at home, and the exceedingly rapid payback once the surgery is performed, my recommendation is that not only do we immediately reopen access for physicians to apply for their patients' out of country surgeries, we mount a campaign to educate them how to do so. Ultimately what all this means is the question of how we got to this point in socialized medicine Canada really doesn't matter, and while I believe societal obesity is a disease of the environment, if you want to retain the biased stance that somehow obesity should be blamed on individuals and is a disease whose treatment should not be publicly funded, you'd be best to bear in mind that your bias and ignorance are likely costing you and your country a fortune.